This article is about minigame in Mario Party and Mario Party 2. For the last level of Donkey Kong Country, see Platform Perils. 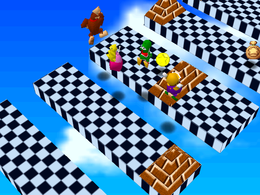 Platform Peril is a 4-player minigame found in Mario Party and Mario Party 2. This minigame takes place over the skies with several floating checkered platforms. The object of this minigame is to jump from platform to platform and reach the end first while avoiding obstacles. The players can also collect additional coins located on few platforms. If a player jumps into a pyramid of bricks, they will fall and will be out of the minigame. The player can also fall if they do not make the platform itself. If a player is jumped on, their movement and jump will be restricted, making success more difficult. However this can backfire as the bounce from the jump can cause the jumping player to lose control. The player has to be quick and not be too detracted from collecting coins as a few seconds can make all the difference. In the Mario Party 2 version of the minigame, the main difference is the addition of more obstacles in the race. There is also the inclusion of moving platforms as well as platforms that have a treadmill effect either going forwards or backwards. Game Rules – "These platforms will fall as you jump on them. Jump across the platforms and be the first to cross the goal line." Advice – "In various places above the plates, there are Coins floating in the air. The first one there gets them." Game Rules – "Jump across the platforms that fall from the sky, as you race to be the first to cross the finish line." Advice – "Some platforms have obstacles and conveyor belts, so watch where you jump and where you land." French Plate-forme Péril! Platform Peril! The music played during this minigame in Mario Party is a cover of Giant Land's map music from Super Mario Bros. 3. This page was last edited on October 29, 2018, at 14:04.